I was looking through Savannah & Isaac's baby album and thinking about how tiny they were! 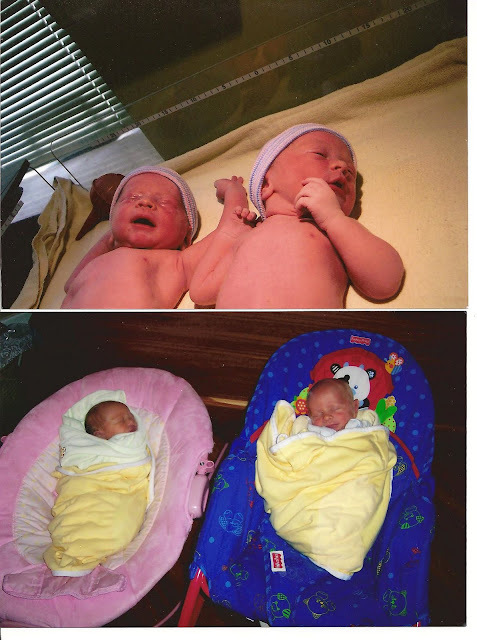 The top picture is right after they were born. Isaac is on the left, Savannah on the right. The bottom picture is after we brought them home. Savannah on the left, Isaac on the right. Savannah was 6 lbs, 2 oz, and Isaac was 6 lbs, 11 oz. For me, and for Joe, looking at each other and hearing our babies cry for the first time was the most amazing and miraculous experience we have had. There is nothing else like it in the world! "Where can I go from Your spirit? Or where can I flee from your presence? If I ascend into heaven, You are there; If I make my bed in hell, behold, you are there. I will praise You, for I am fearfully and wonderfully made." I remember those days! How big were they? Mine were 5lbs 1oz and 4lbs 10oz, but I had them at 35 weeks. Mine were born by c-section at 37 weeks. Savannah was breech & born 2min. before Isaac, weighing 6 lbs & 2oz, Isaac weighed 6 lbs 11 oz. Isn't that the most amazing feeling in the world, hearing your babies cry for the first time? I remember them being so small and "new". I love these pictures, they are so sweet.